Some may know the name Daniel McKernan from his video projections for Thighpaulsandra, Cyclobe and Coil - the entire EP is dedicated to the late Peter Christopherson of Coil - and for his own video work and installations. Along with Sam Houston, he makes up Protection, an experimental synth-pop duo who have just issued their first release on Formlessness Press. With guest contributions from NY chanteuse Little Annie (on vocals) and Christiana Key (Cult of Youth, Zola Jesus) on violin, this debut from Protection is well worth seeking out. Featuring a manipulated photo of Marie Laveau's tomb from St Louis Cemetery in New Orleans where tourists draw a series of crosses in order to be granted a wish, the opener 'Prayer (Intro)' with its blurred dulcimer, murky experimental tones and intoned chanted voices furthers the magickal intent with what is almost a protection ritual. 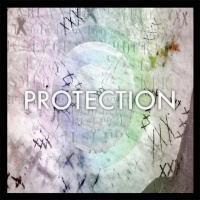 The otherworldliness of Coil seeps in here, but much of the rest of The Ten" EP is best represented by Protection's forays into experimental synth-pop - and they're very good too. 'Popcycles In Bloom' is a prime slice of early industrial synth-pop steeped in despondency, with McKernan almost paraphrasing Carly Simon's 'You're So Vain' in the lines "You probably think you're who this song's about" amidst the desperation of the aftermath of someone's spiralling descent towards death. There's little fun to be had in the narrative of 'I Worry If You're Warm' either, even with its hook filled chorus: "Everything I say you take to heart, And everything you take you take apart". This is a bitter tale of lost love wrapped up in a sumptuous early eighties synth-pop sound, like the kinda thing that would have appeared on Mute back in the day. As the layered voices coalesce towards the end, leaving only Christiana Key's edgy violin scrapes, you realise just how pure and effortlessness Protection make this sound. Comparisons with Cold Cave, maybe, aren't too wide of the mark but Protection can be set apart due to their relationship with Coil - and latterly Cyclobe - which worms its way into the six tracks of their debut. There's a strong queer edge to McKernan's visual art, which has focussed on transsexuals, the transgendered and the pandrogynous, so the androgynous tones of Sam Houston on 'Before I Was A Man' seem quite apt. Over a backbeat of pulsating electronics and loping drum machine beats, Houston's smouldering soulful tone sings of a failed relationship and the indulgences of youth captured succinctly in the lines: "I cried for hours, lived on the phone and sought out depressing bands". And while 'Before I Was A Man' foregoes the hooks of the previous tracks, these lines almost capture the essence of Protection's synth-pop songs: heartbreak has never sounded so enticing. It's not all broken hearts and tortured love though. The knowing, streetwise voice of Little Annie (another subject of McKernan's directorial video work) features on 'Jack/Rabbit' with a tale of street life hustling over clipped rhythms and synth patterns. Multi-layered and slightly treated 'Jack/Rabbit' provides a moment of tension, occasionally augmented by Houston's accompaniment, while those programmed synths are transformed and ramped up into stabbing club synths with booming rhythms on the subsequent 'Jack/Rabbit (stereo bas relief mix)' by Bruno Caviello (of fellow New Yorkers Light Asylum) which rounds off the EP.